© 2002 Plant Management Network. Accepted for publication 7 May 2002. Published 20 May 2002. Seijo, T. E., McGovern, R. J., Dickstein, E. R., Harbaugh, B. K. 2002. Bacterial Crown Rot of Lisianthus Caused by Burkholderia gladioli. Online. Plant Health Progress doi:10.1094/PHP-2002-0520-01-HN. Fig. 1. Severe symptoms observed in lisianthus inoculated with B. gladioli after 2 to 6 days at 28°C (click image for larger view). Lisianthus, Eustoma grandiflorum, is one of the top ten cut flowers in both Europe and Asia. The lisianthus cut flower crop is of growing importance in the United States, where it is being planted by growers to fill the void left when much of the cut flower industry moved to Central and South America (1). Because of lisianthus’ increasing popularity, it is important to document the occurrence of new diseases. In September 2000, a new disease of lisianthus was first observed during transplant production in a greenhouse at the Gulf Coast Research and Education Center (GCREC) in Manatee County, Florida. 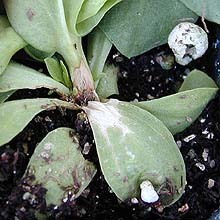 Small seedlings averaging six true leaves displayed a tan veinal necrosis on the leaves; wilt; tap root, crown, and stem rot; and death. Two to three months later a second outbreak displaying similar symptoms was observed in larger lisianthus plants in a field at GCREC. Bacteria of a single dominant colony morphology were consistently isolated from the crown of symptomatic plants from both outbreaks. Tomatoes inoculated with the bacteria produced a hypersensitive response, indicating the bacteria are phytopathogenic. Isolates from both outbreaks were identified as Burkholderia gladioli (formerly Pseudomonas gladioli) using fatty acid analysis (MIDI, Inc., Newark, DE), with similarity index values of 0.598 and 0.713. Identification of the isolate from the second outbreak was confirmed by Biolog Software (Biolog, Hayward, CA), with a similarity index value of 0.956. Pathogenicity was confirmed for isolates from both outbreaks by fulfilling Koch’s Postulates. Six lisianthus ‘Maurine Blue’ plants at the 16 to 18 leaf stage were inoculated with B. gladioli by dipping a sterile toothpick into a 24-h (nutrient agar) culture, then using this toothpick to stab the crown of the plant. Non-inoculated controls were wounded with a sterile toothpick. Plants were maintained in a controlled environment at a constant 28°C and a 12-h photoperiod. Symptoms of bacterial crown rot developed in 2 to 6 days on all inoculated plants (Fig. 1), and B. gladioli was reisolated from a random sampling of 2 symptomatic plants. In the fall of 2001, poor germination was observed in several lisianthus breeding lines. To check for seed viability, a sample of the remaining seeds was placed on moist filter paper in petri dishes to germinate. Damping-off was observed in a number of the seedlings shortly after germination. B. gladioli was isolated from affected lisianthus seedlings, suggesting that this pathogen causes damping-off and can be seed borne. Pathogenicity of two B. gladioli damping-off isolates was confirmed on six 8-to-12-leaf stage lisianthus transplants per isolate (B. K. Harbaugh breeding line 334) as described above except that a dissecting needle was used instead of a toothpick. These plants were maintained in a greenhouse where the average high was 25°C and the average low was 12°C. In this cooler environment symptoms took 2 to 3 weeks to develop. At three weeks all inoculated plants were symptomatic. Some plants had typical symptoms, while others appeared stunted with the crown rot visible only on close examination (Figs. 2 and 3). B. gladioli was reisolated from a random sampling of two symptomatic plants per isolate. Fig. 2. 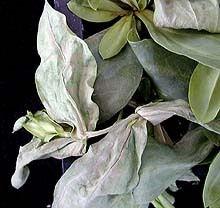 Lisianthus plant inoculated with B. gladioli exhibiting crown rot and leaf necrosis after 2 to 3 weeks at 12 to 25°C (click image for larger view). Fig. 3. Non-inoculated control plants (left) contrasted with lisianthus inoculated with B. gladioli (right), after 2 to 3 weeks at 12 to 25°C (click image for larger view). This is the first report of a bacterial pathogen of lisianthus. The bacterium, B. gladioli, can be seed-borne and causes a rot of the tap root, crown, and stem, leading to death of plants ranging in age from small seedlings to mature flowering plants. 1. Harbaugh, B. K., Bell, M. L., and Liang, R. 2000. Evaluation of forty-seven cultivars of lisianthus as cut flowers. HortTechnology 10(4):812-815.